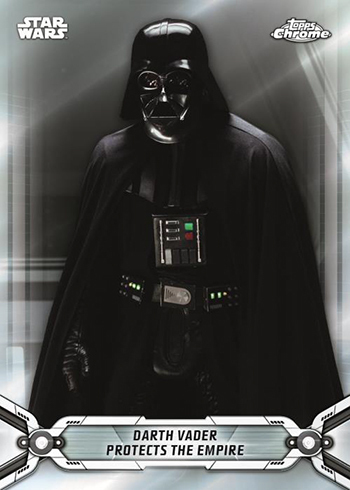 2019 Topps Star Wars Chrome Legacy trading cards go back to a far away galaxy to recap eight movies worth of moments and characters. 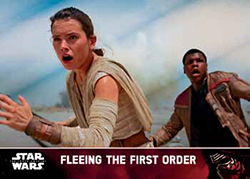 Centering on just the main Star Wars movies thus far, the checklist is a mix of what collectors expect from a chromium Topps release. That means lots of color-based Refractors. Hobby boxes, which consist of a pair of six-pack mini boxes, come with an autograph or sketch card plus one additional premium insert. 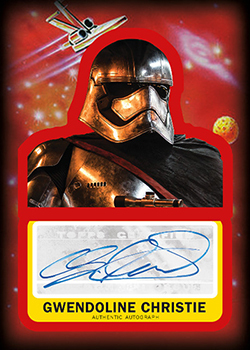 A total of 200 cards make up the 2019 Topps Star Wars Chrome Legacy checklist. It’s somewhat limited in scope, at least on the Star Wars scale, sticking to the original trilogy, prequels and the two most recent sequels. Spinoff movies, TV shows and other realms of Star Wars lore are not found here. Sadly to three collectors, that means no Holiday Special, either. In typical Topps Chrome fashion, there’s a rainbow of Refractor parallels. Basic Refractors, which have a rainbow background pattern when shone under bright light, are 1:3 packs. Other Refractors colors include Blue (/99), Green (/50), Orange (/25), Black (/10), Red (/5) and Superfractors (1/1). 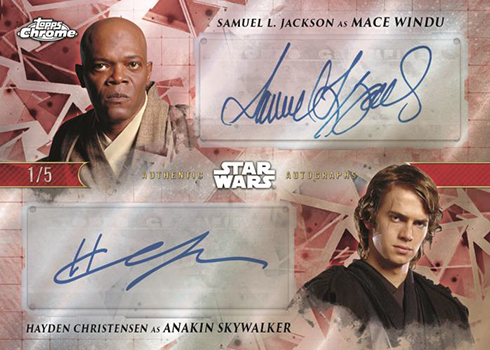 Like the base set, autographs feature Classic Trilogy, Prequel and New Trilogy themes. All three are divided up into different parts on the checklist, each with different designs. 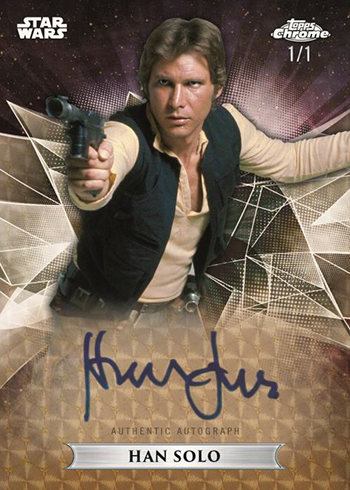 Mock-up image, not final autograph card. Autograph parallels come in the form of Blue Refractors (/99), Green Refractors (/50), Orange Refractors (/25), Black Refractors (/10), Red Refractors (/5) and Superfractors (1/1). Dual Autographs are also available in packs. These have just three Refractors parallels, all of which are tough: Black (/10), Red (/5) and Superfractor (1/1). 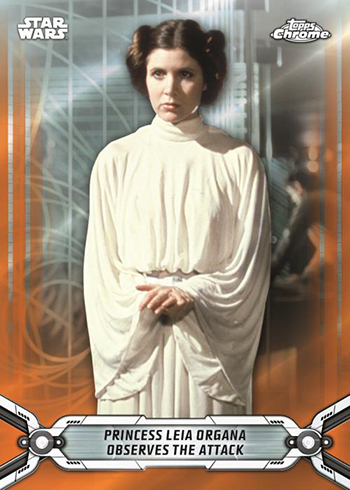 2019 Topps Star Wars Chrome Legacy has a few other insert sets. Marvel Comic Book Covers represent the first time they have become cards in a Topps card set. 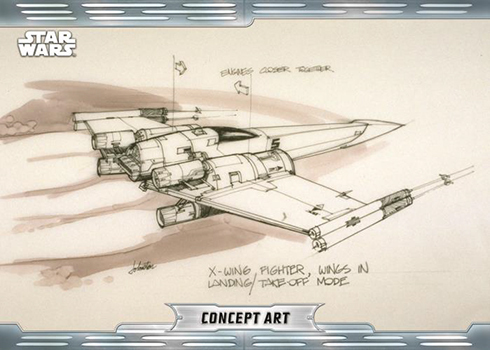 Other regular inserts include Posters, which highlight advertising art from the eight movies, and Concept Art that show things in the planning stages. All three of these inserts have five levels of Refractor parallels: Green (/50), Orange (/25), Black (/10), Red (/5) and Superfractor (1/1). 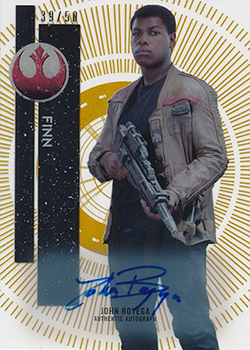 As far as other premium inserts go, 2019 Topps Star Wars Chrome Legacy has two outside of autographs. Sketch cards come with original art. Besides regular cards, there are Shaped Sketch Cards cut to the outline of a Porg. Commemorative medallions come with a Droid theme this time around. These have Blue Refractor (/99), Green Refractor (/50), Orange Refractor (/25), Black Refractor (/10), Red Refractor (/5) and Superfractor (1/1) parallels. Star Wars Chrome, UFC Chrome, MLS Chrome, among others…for crying out loud can we at least get a Pro Debut Chrome or a Heritage Minors Chrome? It’s coming up on 10 years for each of those products. MiLB isn’t a charity case. At least a Chrome parallel or insert set for one of those products.